Hello! This #WebTortoise post was written 2013-JUN-12 at 02:45 PM ET (about #WebTortoise). #- Use panel charts for certain web performance data to make reading them easier. #- Will need to manually calculate trend lines for panel chart data as the Excel built-in trend line function(s) ‘spans panels’. In Webtortoise World, are constantly looking at Performance and Availability data by various dimensions. Can look at data by Host (Performance of Host1 vs Host2 vs etc), by ISP (Performance of Verizon vs L3 vs etc), by Geography (Performance of East Coast vs West Coast vs etc) and by etc. The problem is can be tough to discern and understand when there are a lot of chart data on a single chart. Panel charts take multiple chart data and split them into separate ‘panels’, while still being on a single chart (the illusion is of multiple charts, though). These panel charts are generally shown side-by-side and have the benefit of using the same axes (by default). This first chart is not a particularly atypical chart type. 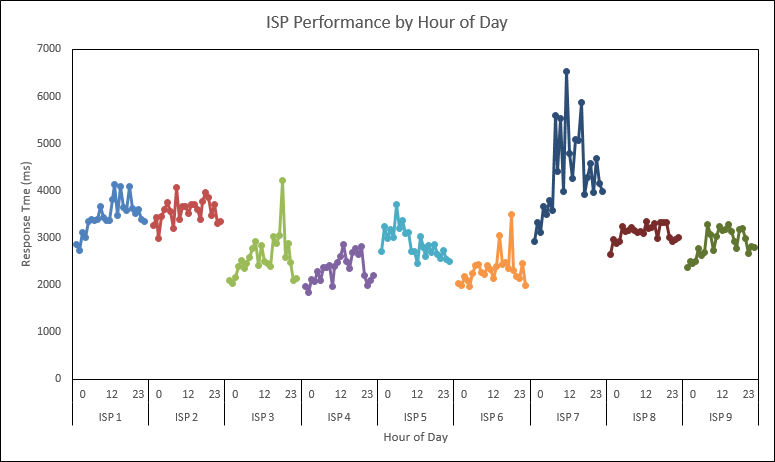 It shows respective median Response Times, for a 24-hour period (2013-JUN-06 to be exact), by ISP. It could be Synthetic data, could be RUM data or could be data from any other instrumental ‘ruler’. Is not important this Breakdown is by ISP (the Breakdown could be anything really). What IS important is to concede how tough it is to read the individual measurements. Who’s the worst performer? Who’s the best performer? Are they all following the same trend? 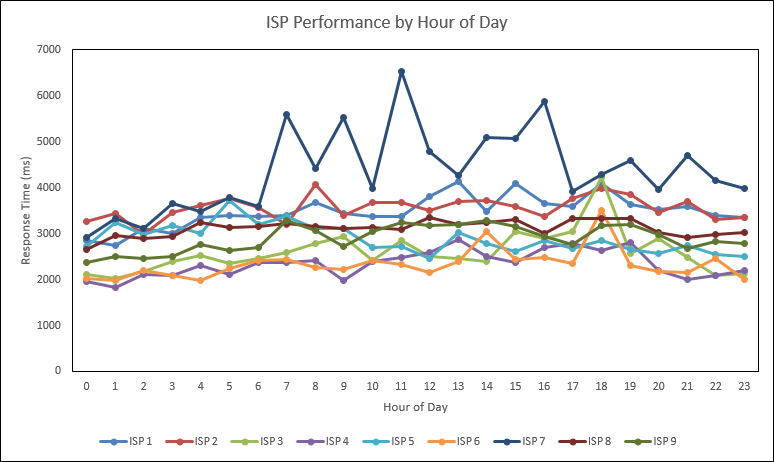 Is taken the above line chart and made into this below panel chart, with each of the respective ISP’s Performance data in their own panel. With [intentionally] no additional formatting, can more easily read the information (No additional formatting was applied so as to compare only the layout change. Purpose is to convey the value of the panel chart based on its own merit). One thing would not ever attempt to do with the first chart is add a trend line for each series! Shudder to think how much of a hot mess that’d have been! With the panel chart, though, adding trend lines makes the chart even more valuable (In this case, added 2nd-order Polynomial trend lines as might expect a Performance pattern to be similar to peak traffic pattern). Note to add trend lines to each panel means to manually calculate the trend line for each series (see article link in the below optional section) as Excel’s built-in trend line capability ‘spans panels’. Q: Who’s the worst performer? A: ISP 7 is clearly the worst performer. Q: Who’s the best performer? A: ISPs four and six are neck-and-neck for ‘the best performer’. Q: Are they all following the same trend? A: No! 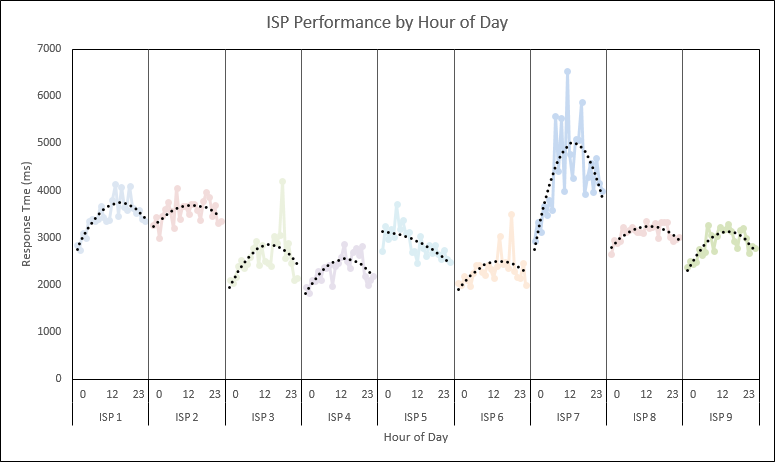 While each other ISP has a slight Performance degradation during peak traffic, ISP 5 is actually trending down!